Montezuma Falls was often said to be the favourite stage of competitors in the Wildside 4 day stage race. It is also the muddiest! It is located in the west coast of Tasmania, with a history rich in mining, forestry and hydro-electricity generation. Montezuma Falls can be ridden in a variety of ways but the most enjoyable is traveling from north to south. How and where you starts depends on how many km you want to ride, if you want to double back or if you have the opportunity to shuttle to the start or finish. 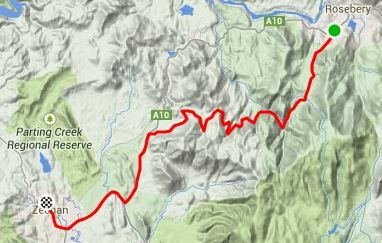 Either way, it's best to plan the day riding this route. If just traveling in one direction along the old tram line / route, leaving Williamford carpark and coming out at Melba Flats, you'll travel around 20km. 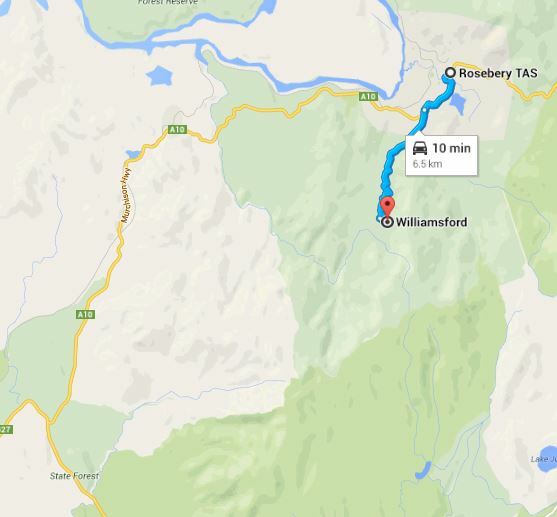 You'll need to get a lift to Williamford Carpark and / or from the highway at Melba Flats. There are plenty of accommodation options a Rosebery or a few basic ones at Zeehan. Zeehan maybe a better option if you plan to ride Climes Track on the coast, between Trial Harbour and Granville Harbour. Montezuma Falls is the tallest in Tasmania at 104 metres. The name of the falls appear to have come from the Montezuma Silver Mining Company which once operated a lease in the area. The Montezuma Falls lay at the end of a 4WD track that follows an old tram line. When the tramway was operational, the creek immediately below the falls was spanned by a 48 metre long wooden trestle bridge. This was an impressive engineering feat for its time, especially given its remote location. Trams used to carry minerals from Williamsford to the smelters near Zeehan along this route through dense rainforest - called the Dundas Railway. It was a 2ft gauge line and was opened in 1898 to service the Hercules Mine on Mt Reid. The railway became redundant when an aerial cableway took the haulage via Rosebery.